Willis Haynie Davenport, an African American educational leader, was born on August 18, 1900 in Burgess, Virginia to parents Addie Haynie and Warner Davenport. He worked for the Greenville, North Carolina school system for thirty-seven years, twenty-three as principal. Davenport received an undergraduate degree in biology from Virginia Union University and a Master’s degree from Hampton Institute. Earlier education was received in public schools in Burgess, Northumberland County, Virginia. By 1918, he was living in Philadelphia, Pennsylvania where he managed a hotel for two years. During that time with World War I underway, he registered for the draft, although he was never conscripted. In the 1920s he returned to North Carolina where he taught in public schools in Wilson from 1925-1926. In 1928, he moved to Greenville where he taught math and sciencec and coached football at the Greenville Industrial High School. In the late 1930s, he met a teacher in the Fayetteville school system, Salina Washington Langhorne, and they married on April 8, 1939. Salina Davenport taught French and music in Greenville’s City school system. Davenport's philosophy about students was pragmatic. He expressed a wish that “students would realize the necessity of learning a vocation”, as he acknowledged that only about 40% of black students who graduated from C.M. Eppes in 1960 went on to college. There was measureable growth in the City’s Colored Schools over the Davenport years. An article in the Daily Reflector in 1961 reported that in 1942 the existing two black schools were staffed by 32 teachers. By 1961, staffing was at 64 teachers for three schools. These three schools overseen by Davenport were the Fleming Street School (Sadie Salter), South Greenville School, and C.M. Eppes High School. As a follower of Professor Charles Montgomery Eppes, who had been an outspoken advocate of Booker T. Washington's philosophy of interracial cooperation and accommodation, Davenport was known for his ability to get along with others and for establishing good relationships. Some considered him “an extension of Eppes.” But while Eppes had been at loggerheads with the National Association for the Advancement of Colored People (NAACP) for decades because of his seeming accommodation of whites, Davenport was able to reach across the ideological divide. An example can be viewed in his interaction with Mr. D.D. Garrett. Garrett, who was the local leader of the NAACP, had started his own school of bookkeeping and typing because there was demand in the black community for these job skills which were not being met by the school system. Davenport asked D.D. Garrett if he would be interested in allowing the school system to teach typing and bookkeeping. Both agreed to the proposition to advance the betterment of their mutual community. Davenport was a member of the Sycamore Hill Baptist Church in Greenville and served as its Chairman of the Trustee Board for several years. Always active in the community, Davenport organized the first Boy Scout troop for African American boys in Pitt County. He was a member of the executive board of the North Carolina Teachers’ Association, and served as Chairman of the East Carolina Council of the Boy Scouts of America. In 1964, Davenport was awarded the Principal of the Year Award by the North Carolina Joint Council on Health and Citizenship. And in 1965, Omega Psi Phi, the international black fraternial society founded in 1911 at Howard University, awarded him its Distinguished Service Award. After nearly four decades of service to Greenville’s Colored Schools, W.H. Davenport retired on June 30, 1965. Willis Haynie Davenport died on October 27, 1966 at Pitt Memorial Hospital in Greenville, North Carolina at the age of 66. He was survived by his wife. The Greenville City School Minutes of December 15, 1966, states that W.H. Davenport was born in Reedsville, VA. And a framed document biography of Mr. Davenport that hangs in the Eppes Cultural Center states that he was born in Burgess, Virginia. Greenville School Board Minutes, August 11, 1942. Daily Reflector (Greenville, N.C.): January 16, 1961, June 24, 1965, June 25, 1965, October 26, 1966. Daily Reflector, January 16, 1961 and the Biography of Mr. Davenport that hangs in a frame next to his photograph at the C.M. Eppes Heritage Center in Greenville, North Carolina. Author’s Interview with Jimmy Jones, July 12, 2017. Denison D. (D.D.) Garrett, Sr. Oral History Interview, 1914-2009, East Carolina Univeristy, Joyner Library. “Obsequies for Willis Hayne Davenport, C.M. Eppes High School Gymnasium, October 27, 1966, Sheppard Memorial Library Vertical Files, Greenville North Carolina. Photograph of Salina Davenport: Educators in Eppes High School classroom. August 20, 1964. Item 741.33.d.56, East Carolina University Digital Collections. http://digital.lib.ecu.edu/51011 (accessed August 2, 2017). [C.M. Eppes High school Principal W.M. 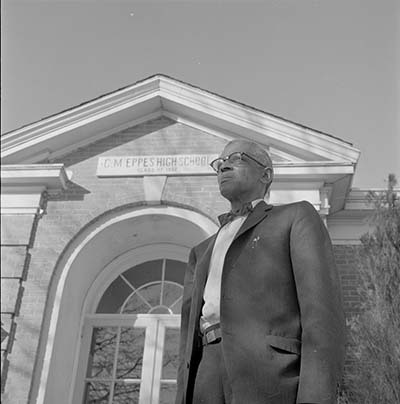 Davenport standing in front of the school building.] Photograph. January 19, 1961. Item 741.26.a.44, The Daily Reflector Image Collection, East Carolina University Digital Collections. http://digital.lib.ecu.edu/5238 (accessed August 1, 2017).